It’s a good thing I skipped the fair. If I had gone, I never would have discovered these potatoes. And these potatoes satisfy. Simple, hearty fare, they are the perfect match for meat, fish, salad, or soup. 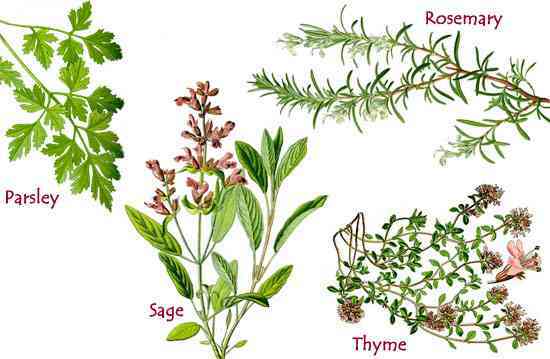 Sprinkle with any of the aforementioned herbs and they become glorified homefries of the highest order. If you really want to gussy them up, drizzle with a little truffle oil. So, crank up your oven and your Simon & Garfunkel tunes, get a pot of water boiling on the stove, and make these taters. Browned, crispy and deeply comforting, they are the fairest fare of all. Preheat oven to 450 degrees. Bring a pot of salted water to a boil. Add potatoes and cook them until they are fork-tender, about 10 minutes. Be sure not to over-boil them. 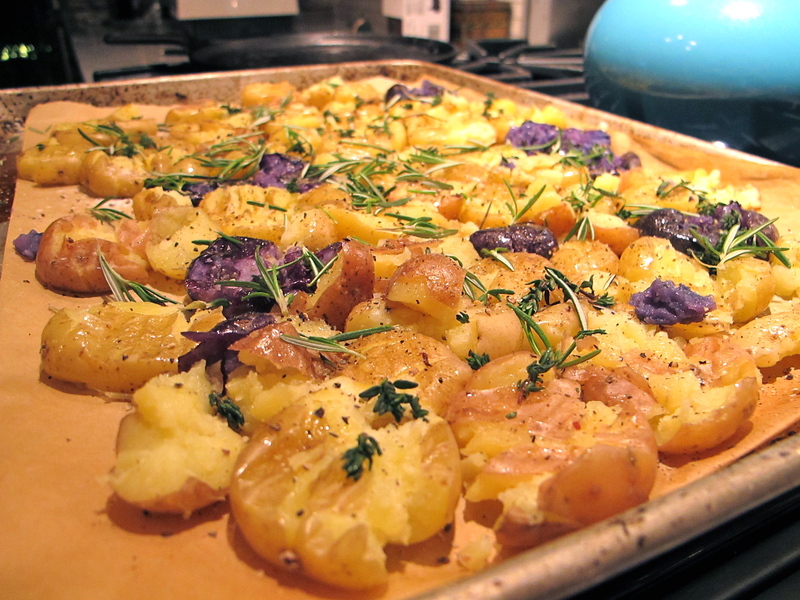 Drizzle olive oil on a cookie sheet and toss tender potatoes to coat evenly. With the back of a fork, gently press down each potato until it slightly mashes, rotate the fork 90 degrees and mash again. Brush the tops of each crushed potato generously with more olive oil. 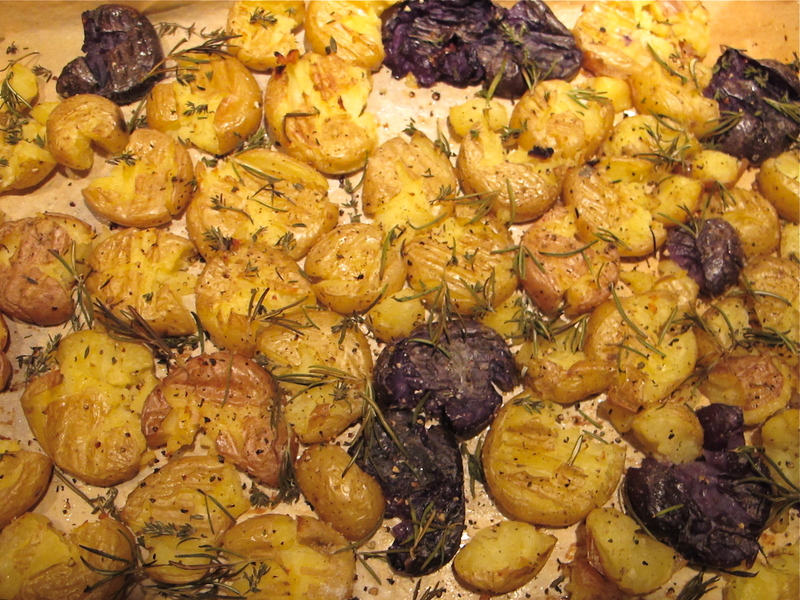 Sprinkle potatoes with kosher salt, fresh ground black pepper and fresh chopped herbs. Bake in a 450 degree oven for 20-25 minutes until golden brown. Drizzle with truffle oil if you’re going the fancy route. Yummy! Our family could not stop eating the potatoes! I love how the potatoes get a little crispy bottom after roasting them. I added smashed garlic cloves before baking and they were heavenly! Thank you, Happelsauce for another excellent recipe!